There are plenty of ways to live and travel comfortably on a long road-trip. The most cost effective is likely to convert a vehicle, such as a van, into something a little more useful. 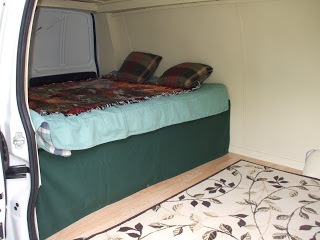 When converting a plain old van into a camper van, one of the most important steps is installing the bed. We all need to sleep, after all. To help you sleep comfortably, you might need to purchase a few extra accessories, such as ear plugs or light-blackout curtains, but often your comfort on the road will begin and end with the all important bed. Seasoned traveler and RVer, Curtis Carper of the website Do It Yourself RV, shares his three ideas for building a bed in your camper van. Take a look at all three and choose wisely which best fits your needs. The first bit of advice Carper gives is in regards to the building materials. He says that while your instinct may be to opt for more durable, thicker woods, remember that you won’t need excessively thick wood to support your weight. Purchase good quality materials, but don’t waste your money on massive ones. Also keep in mind that you don’t want to add a lot of extra weight to the van. The first bed Carper shares is a the smallest of the three. If you’re worried about having extra space to move around, this will be your best option. 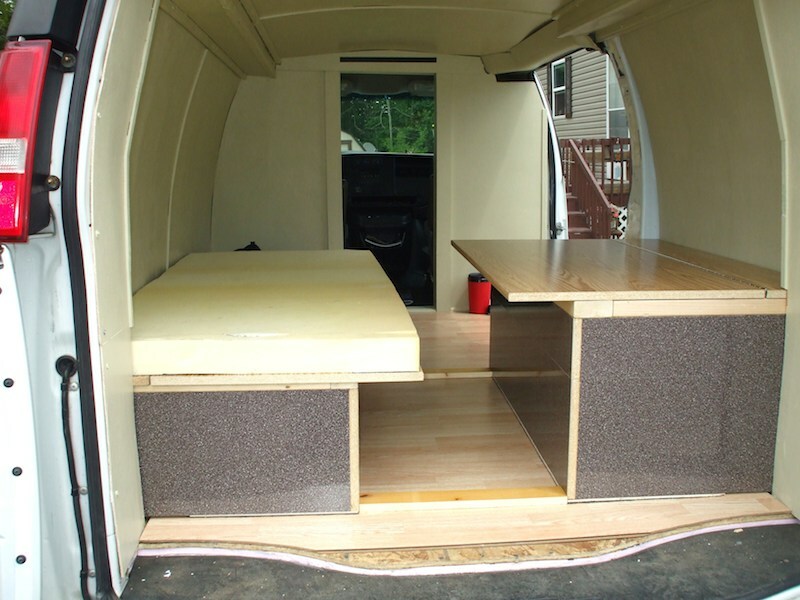 Install the bed horizontally along the back end of your van, and save the rest of the floor space for other uses, like a sitting or storage area. For extra hidden storage, you can slide your boxes and bags underneath the curtain beneath the bed, using the back doors to access larger materials comfortably. If you sleep alone, are on the short side, or are willing to sleep slightly curled up, this setup may be worth it for the space it conserves. Carper’s second option trades in the shorty’s limited length for limited width. By arranging the bed lengthwise in relation to the van’s orientation, you’ll have much more room to stretch out, but far less to shift around in the night. If you’re a restless sleeper like me, this setup may leave you struggling to turn and shift without upsetting the mattress or falling to the floor. The storage space in this design is accessed through a trap door that lifts up to reveal a hollow storage space in the supporting structure beneath the bed. This space keeps your items in a more well-confined area. Both this design, and the one above, employ dense foam mattresses, which won’t hold their shape as well as most campers will want. Carper recommends that you consider investing in a more durable mattress to help you sleep easier. 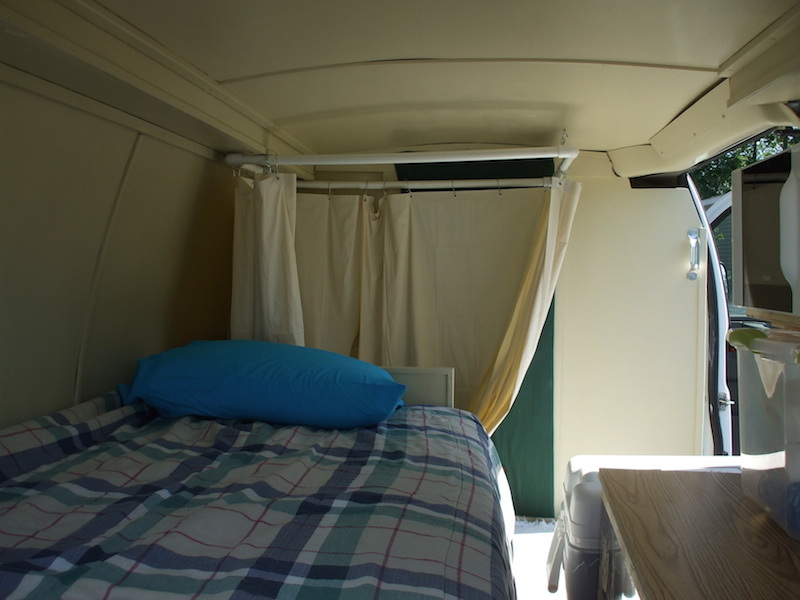 Using your shiny new store-bought mattress, you can construct a standard sized twin bed along one wall of the camper van, thoroughly limiting your storage space, but maximizing your sleeping space. 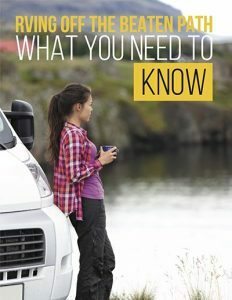 Carper suggests that it may be in your best interest to abandon a standard kitchen in your camper van if you decide on this setup. Instead, opt for a chuck wagon-style kitchen, accessible through the rear doors of the camper van. One possible exception, Carper notes, would be your microwave, which could be placed near the side doors beside your bed. Carper adds, “The weather won’t always be perfect, and being able to heat up your Hot Pocket sandwich or a cup of ramen noodles on a rainy day without having to open up the chuck wagon kitchen is a big plus”. 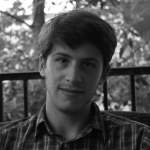 For more information on creating your own camper van, see Curtis Carper’s other articles on DoItYourselfRV.